Although a lumbar laminectomy may be recommended, the decision to have this treatment is completely up to you. You will find all the positive advantages and negative effects of the procedure in this section, allowing you to make an informed choice. If any of your questions are not answered you should consult your surgeon and team of health care specialists. In preparation and to plan the operation an MRI scan will confirm diagnosis. You will undergo several other checks to ensure that you will receive the correct operation for your condition. Be clear on the name of the surgery you are admitted for, so that you can relay this to the health care team. A vertical incision will be made in the centre of your lower back and your muscles will be parted to access the spine. To widen the narrow part of the canal, bone and ligament tissue will be removed This will allow more room for both nerves and blood vessels to perform. Any medication that you take should be listed for your doctor so they can advise you on the procedure accurately. The list should include all medications including blood-thinning medication, herbal or complementary products, dietary supplements and over the counter medication. • Stop smoking several months prior to the surgery. This will reduce the risk of complications and also be better for your health. Nicotine can prevent healing to wounds of lower back surgery, thus increasing the likelihood of scarring and acute pain. • Maintain or lose weight. There is a higher risk of complications if you are overweight. • With regular exercise you will be in better shape to face the operation and also to make a good recovery. Always ask the advice of your doctor about the type of exercise you should undertake. • Reduce the risk of wound infection by not shaving or waxing the wound area in the week prior to the procedure. • Bath or shower either the previous day or on the day of the operation. • Keep warm, especially whilst waiting and after the operation. Let the health care team know if you are cold at these times. Are there complications that could occur? The health care team will take all necessary precautions to ensure that your operation avoids any complications. Some complications can be serious, i.e. the risk of death at 1:300. Your doctor will be able to advise you and explain if the risks are higher or lower for you. • The anaesthetist will discuss potential problems related to an anaesthetic. • Pain. You will be given medication to manage the pain. You should take it as prescribed to make movement easier. • Bleeding during or after the operation. This complication, called extradural haematoma, puts pressure on the nerves. There is a risk of 1:125; if this occurs another operation may be needed. • Difficulty going to the toilet (risk 1:125). A catheter tube placed in your bladder for one or two days should relieve the problem. • Infection of the incision site (risk 1:40). Showering is usually allowed after two days, as long as your health care team have authorised it. Symptoms you should alert the medical team about are a high temperature, pus coming from the wound, inflammation, soreness or pain. Antibiotics will usually clear up an infection; if this is not the case it usually means a second operation. • Blood clotting in your leg (deep-vein thrombosis or DVT: risk 1:125). Symptoms could be pain, swelling or inflammation in your leg or near-surface veins appearing larger than usual. If you notice these symptoms let the health care team know immediately. They will encourage you to get out of bed quite quickly after the operation to avoid this. They may also treat DVT with medication, injections or special stockings. • A blood clot in your lung (pulmonary embolus). This is when a blood clot has passed through your bloodstream to the lungs. Symptoms to look out for include shortness of breath, pain in the chest or upper back or coughing up blood; if you experience any of these alert the health care team at once. If you have already left the hospital, call an ambulance immediately. • Chest infection. Antibiotics and physiotherapy are likely treatments for this. • Heart attack or stroke (loss of brain function caused by a disruption in the blood supply to the brain). Sometimes these conditions can result in death. • On-going pain and numbness of the leg which can be the result of spinal nerve damage (risk 1:250). • Lack of feeling between your legs, causing problems with bowel and bladder movement and erections in men. These problems occur when spinal nerves are damaged during the procedure. Nerves can repair themselves over time but there is a 3 in 5 risk that they will not completely return to their original state. • Neuropathic pain. A burning pain can be experienced once pressure on the nerves is released; this may need special pain relief. • A dural tear, aka a tear in the thin membrane covering the spinal nerves (risk less than 3:100). The risk is higher if this is the second procedure of this kind. This problem may cause spinal fluid to leak causing a bad headache over a number of days. The surgeon may decide to repair this tear either during the original surgery or in a follow-up surgery for this purpose. • Spinal infection (risk 1:100). The normal procedure involves a second operation to clean out the infection plus a long course of antibiotics. • Instability of the spine i.e. too much movement between the vertebrae. The risk is dependent on the amount of bone and ligament removed. A further operation may be necessary to stabilise the spine. • Following the procedure you will move first to a recovery area and then to the ward. • You will be encouraged to start walking the day after the operation. • The wound needs to be kept dry for four – five days. The health care team will explain when you need new dressings or stitches / clips removed. • If you make good progress you will return home after two or three days unless the doctor feels you would benefit from staying longer. • If you are concerned at any time when in hospital or later at home, contact your health care team. • Follow the instructions of your health care team carefully to avoid a blood clot, including taking medication or wearing special stockings. • Follow the programme of exercises given to you by the physiotherapist to strengthen your back. The exercises will help protect you from getting similar back problems again. • The healthcare team will tell you when you can return to normal activities. Make sure that you do not lift anything heavy or twist your body. Good posture when sitting and walking and regular exercise will help you to heal and get back to normal as quickly as possible. • Before you start any exercises, please speak to your doctor or the healthcare team. • Driving should not be undertaken until you are confident about your ability to control the car. Before you start, check your insurance policy and with your doctor. • Approximately 17 out of 20 people make a good recovery from this operation, returning to normal activities. • Leg pain should not be a problem but you may still feel occasional back pain due to on-going wear to your spine. Acute back pain could be caused by instability and may require a spinal fusion procedure. 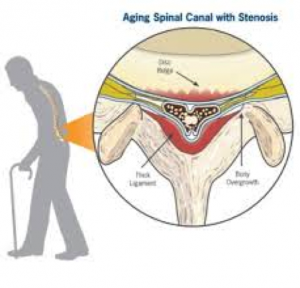 • The return of spinal stenosis either in the same or a different place is possible. The probability of this is low with just 4:100 needing a second operation within four years. Narrowing of the spinal canal in your lower back is known as lumbar spinal stenosis, a condition which may cause weakness in the legs or pain in the lower back. The surgical procedure aims to inhibit deterioration of the condition. While surgery is usually very safe, complications are possible and this page helps you to understand what they are. This allows you to make an informed decision about having the procedure and about detecting symptoms of complications early.